The cottage lies in the hamlet of Lovacott, just south of Barnstaple. Barnstaple offers a large variety of shops, pubs, restaurants and leisure facilities. A few miles away are some of Devon's best sandy beaches ideal for surfing and other watersports. Bideford is 5 miles away and here you can find the famous Tarka Trail cycle track. Just yards from the front door is footpath ideal for walks that can lead to a cosy, country pub a mile away. The cottage has four bedrooms and sleeps 7 with an additional sofa bed option in the second lounge/snug. There is a downstairs shower room and wc, a family bathroom on the first floor and an ensuite shower room to the main bedroom. There is a large kitchen/diner with range cooker, a separate utility room, a comfortable lounge with log burner, TV and DVD and Xbox 360 and a second lounge/snug with toys/games/Wii/TV/DVD. The cottage has unlimited Wi-Fi. There is a large sunny garden with a patio area with table and chairs for alfresco dining and a large selection of toys/games, chiminea, buckets and spades, windbreaks etc in the shed. I live in North Somerset with my husband, teenagers and black Labrador. We love North Devon, and really enjoy our visits to Marsh Cottage where we can always relax and have fun! I love to hear all the positive comments from guests about how much they have enjoyed their stay in all the different seasons and I am always delighted when guests come back again and again. The North Devon coast is easily accessible and has a variety of beautiful sandy beaches - great for surfing and body boarding etc. The Tarka Trail cycle track is a favourite place for cycling. We enjoy dog walks from the front door including, our favourite a circular walk which encompasses the Hunters Inn, Newton Tracey- even the kids like this walk! 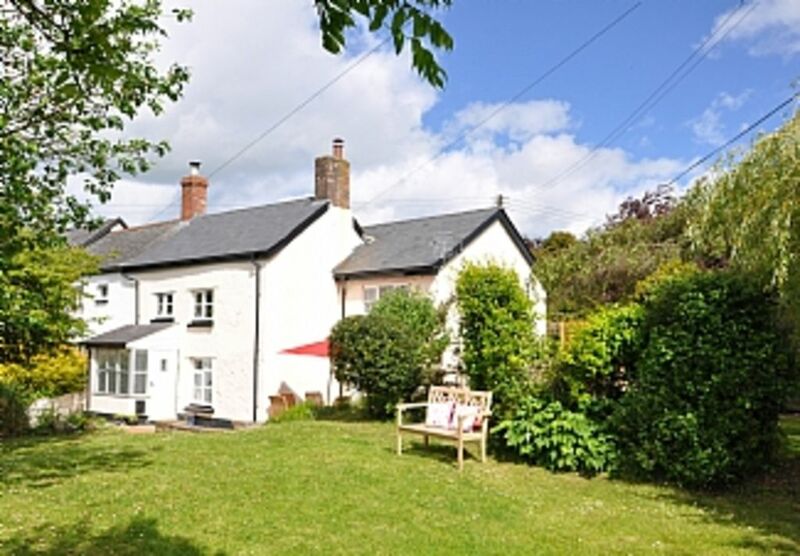 We chose this area because the cottage is in a beautifully peaceful hamlet, although within a few minutes you can be in the bustle of Barnstaple which has a good choice of leisure activities, cinema, shopping and restaurants. The cottage is easy to reach - just three miles from the main Atlantic highway. It is instantly relaxing and ideal for adults, kids and dogs! The garden is great for Giant Jenga, a bit of football, dogs to explore and we think, perfect on a sunny evening to eat and drink on the patio! The cottage has a relaxed feel whether in the summer with doors and windows flung open or in the winter -cosy with the log burner. Having two lounges and a large kitchen means no one is on top of one another, there is plenty of space for all. The cottage has unlimited Wi-Fi. The guests repeatedly comment on the cleanliness and high standard of fixtures and fittings at the cottage and we feel it is a real home from home. Main bathroom: bath, sink, WC and heated towel rail. En-suite to bedroom 1: shower, sink, WC and heated towel rail. Downstairs shower room, sink, WC and heated towel rail. Large stone feature fireplace with wood burner, freeview TV, DVD/CD player, books, local information and maps, music system and desk area with Wi-Fi hub. Dining table for 6 (extends to 8), patio doors to garden, range cooker, kettle, toaster, dishwasher, microwave. Notes on accommodation: Maximum 2 dogs. No smoking property. Outside: There is off-road parking for two cars. Interesting, enclosed, sunny garden with plenty of lawned areas. Patio area with large extending table with reliner chairs and parasol. Utility Room: Utility room with fridge/freezer, washing machine, iron, ironing board, clothes airer, first aid kit and highchair. Cleaning / Towels / Linen / Maid service: All bedlinen, bath and hand towels, tea towels and oven gloves are provided. Weekly cleaning. Other: Second lounge/snug : Sofa bed and comfy beanbags, TV/DVD, Wii console with selection of games, variety of board games, books and toys. Had a great weekend at Marsh Cottages Lovacott, even if the weather was pretty bad the house is very cosy, clean and spacious for the 7 of us, had a fab day playing games and visiting the local pub as the beach was rained off!! Highly recommend for a base to visit the many beaches a short drive away. Had a super weekend in this well appointed cottage. The cottage had everything. Location great for beaches and exmoor. Local beach instow was a real find. Thanks for the review - so pleased you enjoyed not only the cottage but the wonderful location. Always welcome. Beautiful cottage in perfect setting. Had a great week at Marsh Cottage. Lots of room for the family and dog but cosy in the evenings with the log burner going. A very well equipped, clean and comfortable cottage that I would have no hesitation in recommending to anyone wanting a holiday in this beautiful part of the world. Ten mins to Instow beach and lots of walks from the doorstep. Great village pub nearby. Thanks for the 5 star review! It is always nice to hear guess have loved their stay. We pride ourselves that the cottage is cosy and warm in the winter and cool and sunny in the summer, making it ideal to visit at any time of year. Always welcome. Our family of 5 plus dog have just returned from a week in Marsh cottage. The cottage was very comfortable and extremely well equipt. The owners have thought of everything from dog bowls to footballs and cool bags! It was extremely clean and very warm -despite storm Doris. Would highly recommend. Great, delighted you enjoyed your week despite Doris joining you! Always welcome. A real home from home. Lots of lovely Christmassy touches to make our stay enjoyable. I'm please you had a lovely Christmas and happy new year. I hope to welcome you back again to Marsh Cottage. The area is famous for golden sandy beaches. Westward Ho! (8 miles), Woolacombe (15 miles) and Croyde (15 miles), are perfect for surfing, sailing, kite flying, water sports or a picnic and sandcastle making. Appledore (8 miles) and Instow (5 miles) are lovely fishing villages to wander round too. Use of a car is essential. The nearest airport is Exeter (57 miles) and the nearest train station is Barnstaple (5 miles). Nearest pub is at Newton Tracey 1 mile. The nearest supermarket is Sainsburys at Roundswell, Barnstaple (3 miles away). Barnstaple 3 miles, Bideford 5 miles, Great Torrington 7 miles, Exmoor National Park 20 miles. Supermarkets, shops and a variety of restaurants in Barnstaple and Bideford. Food market in Barnstaple in historic pannier market (worth a visit). Local pub within a mile. Gardens to visit: RHS Rosemoor (Torrington) and Marwood (nr Barnstaple). Great walks along the coast and on Exmoor, with good pubs as well. Boat trips from Ilfracombe - fishing, sight seeing, or to Lundy. Riding from various stables on Exmoor. Cycling on the Tarka Trail (old railway line). Lots to do if weather not perfect: The Big Sheep (all weather entertainment park - near Bideford). Atlantic Village factory outlets (near Bideford). Clovelly - famous picturesque fishing village, used for film sets (west of Bideford). Booking Notes: Weekly bookings but short breaks may be available on request. Prices worked on 3 nights - 60% of weekly rate, 4 nights 70% of weekly rate, 5 nights 80% of weekly rate. Bookings can be made by email or phone. We require a non-refundable deposit of 20% at time of booking and request full payment 8 weeks before arrival. Dogs are charged at £15 for first dog, £10 for second dog: maximum 2 dogs. Changeover Day: Changeover day is normally Friday.